I hadn't heard of Baked Oatmeal until we moved to the USA. Even then, I didn't get around to trying it until a couple of months ago. On this lovely morning, Joel graciously let me sleep in whilst he got up with Ezra. 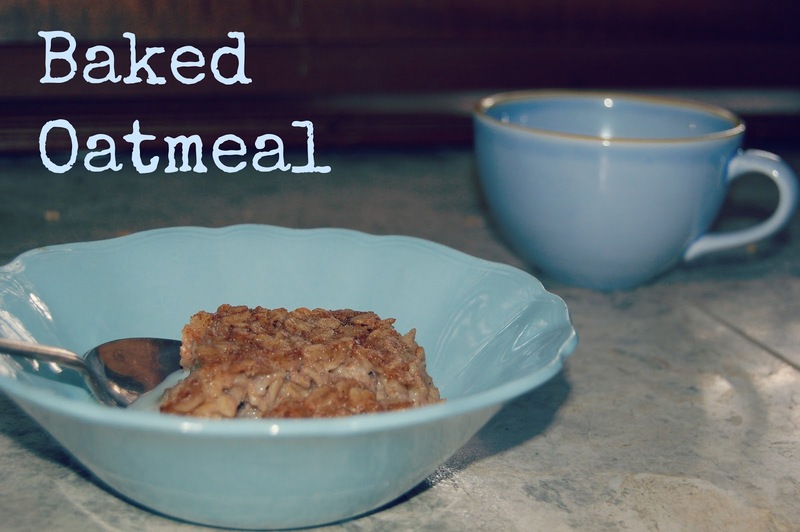 He must have been missing home and hence had a craving for Baked Oatmeal (sometimes he gets these cravings from home, and he has to make something, or just go out and buy a can of Root Beer or something American like that). I was pretty impressed, it was really good. Even better, the kid who is now a little bit too busy with life to sit still and eat, ate two whole bowlfuls of this. Although it could be because of the delicious taste of the maple syrup spread throughout. All of this should fit into a 9inch Pie Pan, or just a casserole dish like we used. Mix everything thoroughly in a bowl and then pour into dish. Cook at 190 degrees celsius for at least 30 minutes. You know that it is ready when it is crunchy on top and is moist, but not too gluggy in the middle. Serve it with milk in a bowl, and you have yourself a delicious breakfast. It usually lasts a couple of days around here as well! I was trying to take pictures, and somebody could not wait for me to finish and through the lens of the camera I see a little hand, and a little spoon, helping himself to the oatmeal. I guess that's when you know you are on to a winner! Is it just my family that was never introduced to baked oatmeal? Or is it not really that common here in Australia? 9 comments on "Baked Oatmeal Recipe"
My boys love baked oatmeal. I bake them in indiviudal muffin tins to make toddler sized servings. Will have to give this recipe a try. 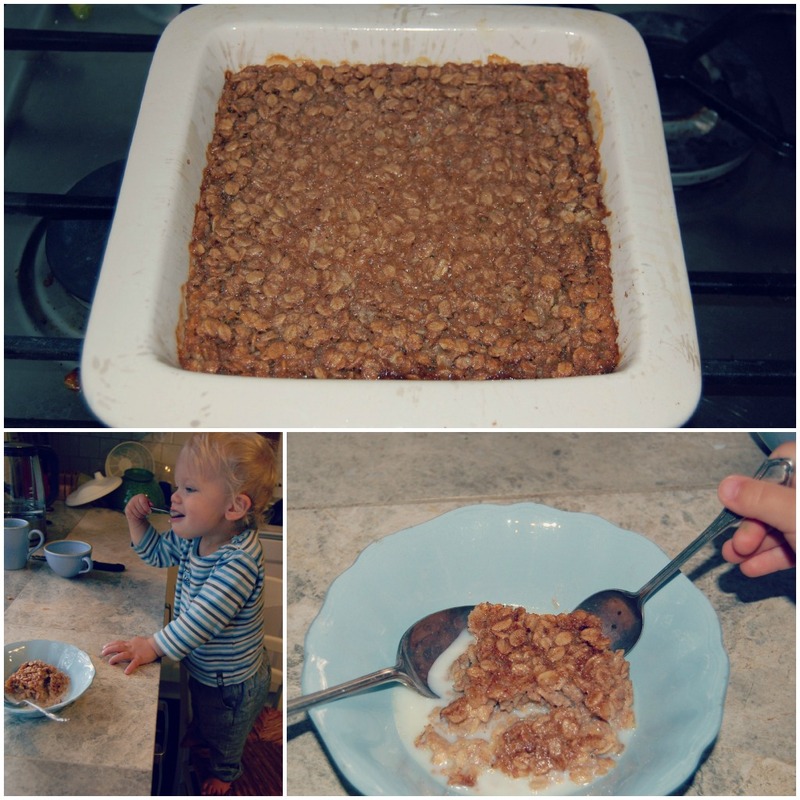 I've never had baked oatmeal unless it counts in a muesli bar? I'm super impressed that your hubby got up and made it! Will have to ask my American hubby if he ever had it? Oh that is a good idea, we might have to try that. Means you can freeze them and save them too!! Brilliant! Ha ha...I make a version of this ALL THE TIME! Maybe because I too am American. I put sliced or mashed bananas as a bottom layer and then I generally put layer of frozen raspberries on the top. He actually loves cooking, and does most of it at our place. He also makes a mean Pie!! It might be because he grew up with Country home cooking in Rural Pennsylvania! Oh that sounds amazing, I'm doing that too next time!! That looks really yummy - may have to keep the recipe until winter as it's too hot here now !!! Can you please make me some? That looks positively delicious!